Do the heels of your feet ache whenever you wear shoes? Do you suffer from Plantar Fasciitis, making it difficult for you to walk? If so, you can read this article to find out about the 5 best walking shoes for plantar fasciitis 2019. Do the heels of your feet ache whenever you wear shoes? Do you have trouble getting your foot on the floor? If so, it’s likely that you’re suffering from Plantar Fasciitis and require shoes designed specifically for them. Plantar Fasciitis is a condition wherein the band of tissues in the soles of your feet gets inflamed, making it painful to walk. The pain usually diminishes as you walk. However, you might continue feeling jabs of pain in intervals, especially if you’re wearing incorrect footwear. However, you can curb the pain if you wear walking shoes for plantar fasciitis. These are shoes designed specifically to support the plantar ligament, thus provide some relief to your foot. Different companies have come up with different styles of walking shoes for plantar fasciitis. However, since this is a medical issue, you should be very careful about the footwear you use. In this article, we’ve compiled a list of the 5 best walking shoes for plantar fasciitis after consultation with several footwear experts and podiatrists. Orthofeet Monterey Bay Comfort Orthotic Men’s Sneakers are perfect for individuals who spend a lot of time standing up or have jobs that require them to walk around a lot. It has been designed in a manner so as to minimize fatigue by absorbing some of the impact of setting foot on the ground. The interiors of the shoes are so soft that it feels like walking on cushions. The soles of the shoes are synthetic and sturdily designed, offering optimal support and traction. In fact, you can even walk on slippery or oily surfaces without fear of slipping. One of the best design elements is the arch support, which is ideal for individuals with either Plantar Fasciitis or Arthritis. Even the inner linings are well-padded to enhance comfort. Even the most snugly fitted shoes will come with some additional space at the end of the toes so you can move them around and allow them to breathe, which is crucial for those with Plantar Fasciitis. Finally, these walking shoes for Plantar Fasciitis have received rave reviews from customers who say that it greatly comforts their feet. Available in 2 colors — Black and White. Body is made of synthetic leather and mesh. Provides Orthotic support with cushioned interior and arched sole. Ortho-Cushion™ System used for the soles to provide comfort. Not the most attractive design. Orthofeet Monterey Bay Comfort Orthotic Men’s Sneakers are the ideal walking shoes for Plantar Fasciitis as it provides optimal comfort, support, and traction. 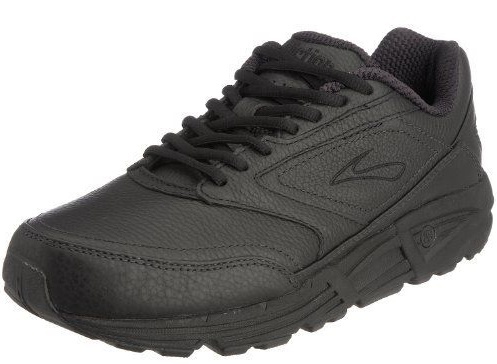 Brooks Men’s Addiction Walker Walking Shoes are the best leather walking shoes for plantar fasciitis. Most shoes in this category shirk from providing leather because it’s believed that they cause discomfort. 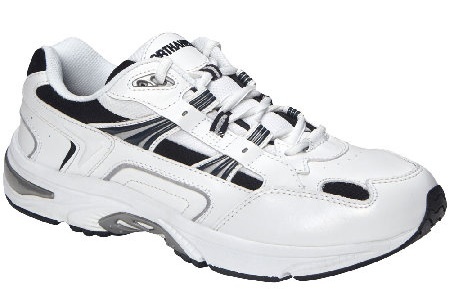 However, this Brooks Men’s Addiction shoes circumvent that issue. They provide comfort while still maintaining the shoe’s aesthetic appeal. You don’t have to let comfort or plantar fasciitis render you unfashionable. These shoes are available in three colors — Black, Brown Suede, and White. The colors are all uniform and even the designs are etched in self-threading. These shoes feature synthetic soles that provide maximum traction while walking, so much so that you don’t slip even on watery or oily grounds. The shaft measures 2.4” from the arch, and it’s loaded with enough support for your low arches so that individuals with plantar fasciitis don’t suffer any discomfort while stepping. It comes with a Hydroflow technology which helps cushion every part of the interiors, preventing shock from affecting the foot. Even the upper full-grain leather has a soft texture to it and has been designed to enhance comfort without sacrificing aesthetic appeal. Available in 3 colors — Black, Brown Suede, and White. Technically designed to enhance comfort and lower shock. A few customers have complained that it doesn’t last long. So durability might be an issue. Brooks Men’s Addiction Walker Walking Shoes for Plantar Fasciitis is ideal for those who want to enhance their shoe’s comfort without giving up on style. Vionic with Orthaheel Technology Men’s Walking Shoes is one of the most reasonable walking shoes for plantar fasciitis. Furthermore, it’s available in a range of 23 different sizes and 6 colors so you have plenty of options to choose from. It’s made of leather and looks extremely plush. One of the features that sets it apart is that it has a manmade sole which has been specifically been designed to enhance comfort and traction. While the upper layer of the shoes is largely made of leather, there are some mesh areas to increase the shoe’s breathability. Like most walking shoes with plantar fasciitis, the arch of the foot is well supported and the inner lining is well padded to minimize shock. In fact, this entire shoe has been designed by a professional podiatrist so you can be assured that it will comfort you. 0.5" elevation from heel to toes. Active Motion System (AMS) technology. Some users complain that the socks bunch in under the foot while wearing it, causing discomfort. Vionic with Orthaheel Technology Men’s Walking Shoes is one of the cheapest walking shoes for plantar fasciitis. 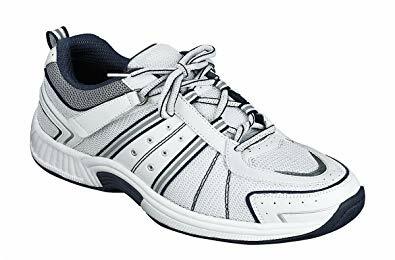 Vionic Women’s Venture Active Lace-up Silver Oxford is the best walking shoes for plantar fasciitis meant for women. It’s available in 8 different stylish color combinations such as White/Pink, Black/Pink, etc. It’s meant for women who want to remain fashionable even as they wear comfortable shoes for their ailing foot. Furthermore, the Orthaheel technology and the biomechanical orthotic footbed ensure that the wearer’s foot is perfectly aligned with the shoes’ footbed, enhancing comfort and minimizing shock. EVA technology and 1st Ray Flexor technology. Doesn’t provide as much traction as other shoes. Synthetic material isn’t ideal for durability. 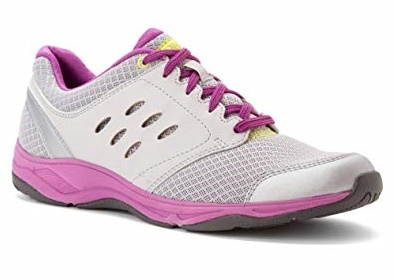 Vionic Women’s Venture Active Lace-up Silver Oxford is one of the best walking shoes for plantar fasciitis meant to be worn by trendy women who favor both aesthetics and comfort. ASICS Women’s Gel-Nimbus 19 Running Shoe is unique in this list because it’s not just great for walking but also for running. If you suffer from plantar fasciitis but your job depends on you running frequently, this is the ideal shoe for you. While this particular model is meant solely for women, there are various unisex designs available as well. In terms of aesthetics, it is flawless and it comes in 7 different colors, ranging from Carbon/White/Flash Coral to Indigo Blue/Paradise Green/Pink Glow. The shoe has been made with synthetic and textile fabric and the soles are made entirely of rubber. It uses the ASICS Fluidfit upper technology which incorporates a multi-directional stretch mesh for flexibility so the user doesn’t feel rigid or stuck. Another cool technology used is FluidRide which provides cushioning for the interiors and provides a bouncy sensation. Furthermore, the GEL cushioning system helps minimize shock. Available in 7 different color combinations. They’re quite flashy so you can’t wear them to formal or semi-formal events. Several users complained that the shoes were quite narrow. 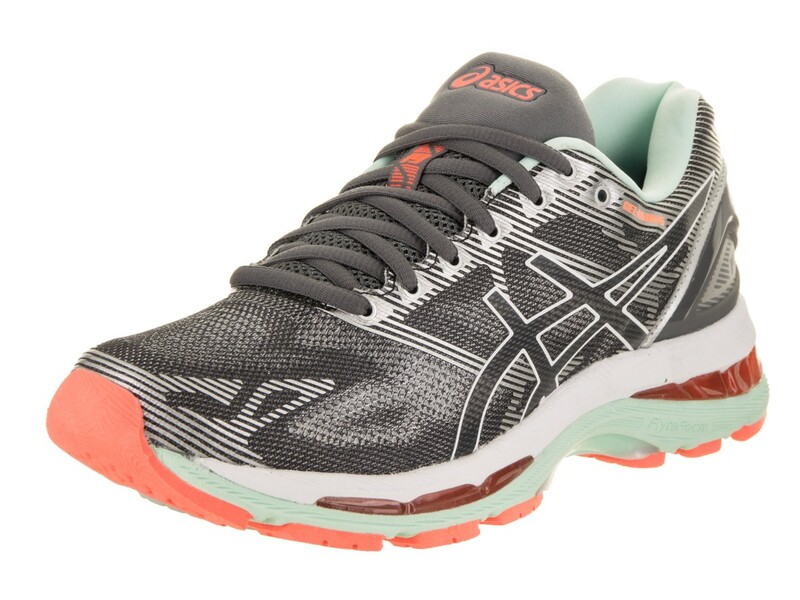 ASICS Women’s Gel-Nimbus 19 Running Shoe is the most stylish shoe for plantar fasciitis out there. The best aspect here is that in addition to walking, it can also be used for running, making it ideal for athletes. I hope this article has helped you figure out which shoe you can wear to comfort your feet and mitigate the plantar fasciitis pains. Be sure to wear shoes that are meant specifically for this condition, and to get shoes from an authoritative brand that has also been validated by expert physiotherapists. Furthermore, you must also be sure to wear properly fitting shoes with a little bit of breathing room left in them. If you put on extremely tight shoes, it will only inflame your condition further. If you have any other questions about walking shoes for plantar fasciitis, feel free to mention it down in the comments section.